Tomorrow I will be cycling around the Olympic Velodrome down at Lea Valley. 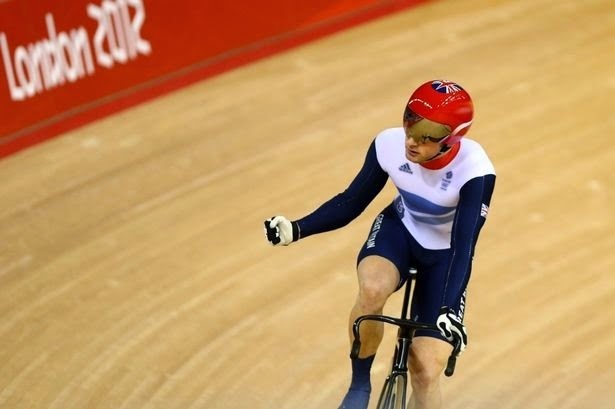 Tomorrow I will be cycling on the same track as our Olympic hero's from 2012. Tomorrow I will learn what it's like to slingshot out of the corner on the track. Tomorrow I could well be making a fool of myself! I have a great opportunity for joining a group of cyclists some beginners and some very much not beginners and getting some coaching on the track. My cycling experience so far is on my Mountain bike, which I only use on road and don't go very fast. This will be my first experience on a track bike, with my feet clipped in and no brakes - OK, no problem, I've had some time to get my head round this. Only I was then discussing this with a friend yesterday who pointed out that if you stop cycling then the bike just stops... and you fall off... hadn't really thought about how the bike stops - I thought you just freewheeled until you slowed down! So this will be a completely new experience for me that might involve some pain! I could spend my time worrying about all the things I haven't done before, all the things that could go wrong, but then in what state would I turn up in and how much would I then enjoy the experience? Not a good state and I can't see that it would be the fun, enjoyable, exciting experience that I signed up for. So I have spent the last few weeks visualising me on the bike and being in control, of concentrating my efforts into what the coach is telling me and translating that onto the track, of being aware of those others around me and letting physics do its job. And this morning adding into that visualisation the constant motion and control of my speed through my legs. And it's not just the visualisation of the physical aspects of tomorrow, it's also hearing the encouragement of friends as we all do our best, laughing at each other when it may not go quite to plan. The feeling of determination and a bit of friendly competition between us, watching those much more experienced zooming round wanting to better myself each time. This means I will be thinking of the 4 statements at the top of this post with a sense of excitement and anticipation, wanting to get going and see what I can do. Does it mean I will get back on again? Definitely yes! I'd like to think I could do a fist pump but not sure I'll be able to take a hand off the handle bars!